The right side of Class A Short Season Tri-City's website features banners displaying the team's recent postseason success, black for division titles, blue for league championships. The ValleyCats took a big step Thursday toward adding more blue to the collection. Houston infield prospect Austin Dennis collected three hits, two RBIs and a run as Tri-City knocked off Mahoning Valley, 8-4, to sweep their best-of-3 New York-Penn League semifinal series. 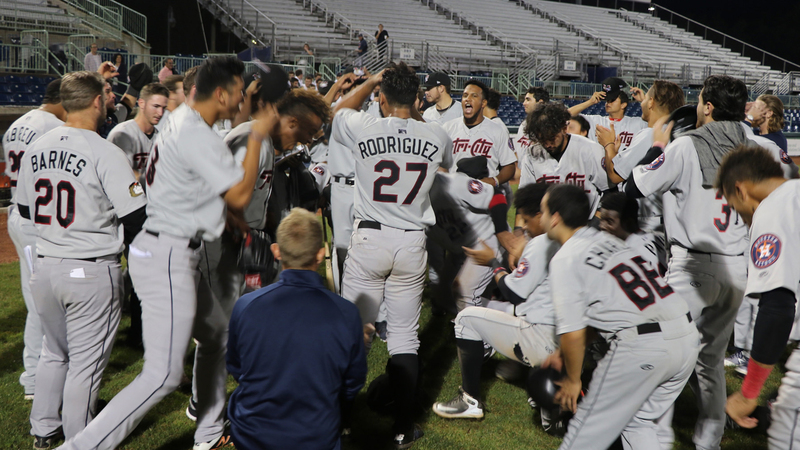 The ValleyCats advanced to their first Championship Series since 2014. Tri-City grabbed an early lead on Logan Mattix's leadoff homer to left field in the second inning, but trailed heading into the sixth. "I thought our guys did a great job of battling," ValleyCats manager Jason Bell said. "I know that may sound cliché, but we hit a home run to go ahead 1-0, and then they came back, went ahead 3-1. We couldn't execute with guys on base, and then the following inning, we had first and second with nobody out, down by two and Oscar Campos was up in a 3-0 count. We decided it was OK to give him the green light, and he hit a base hit that not only scored the one run (Enmanuel Valdez) to make it 3-2, but got the guy from first (Luis Encarnacion) all the way to third with nobody out. It allowed for the big inning to happen." Four more runs followed. Encarnacion and Campos came across on a two-run double to left by Dennis to give Tri-City the lead for good. Deury Carrasco followed with a two-RBI single to center. The big inning made a winner out of ValleyCats starting pitcher Brett Daniels, who allowed three runs -- two earned -- on six hits over five innings. "I also thought Brett Daniels did a great job limiting having a big inning a couple times," Bell said. "We had a defensive mistake that led to a couple runs (in the fourth), but it could have been a lot worse. He did a great job at competing and battling through that. That's what was able to keep it at 3-1 instead of 5-1 or 6-1." Bell needed just one arm out of his bullpen to finish the win. Nivaldo Rodriguez earned the save after giving up one run on two hits over four innings, ensuring a fresh pitching staff for Saturday's opening of the New York-Penn League Championship Series against Hudson Valley. "For us specifically, we have some really strict pitch counts as I'm sure a lot of teams do in a short season," Bell said. "It saves us from having to use too many guys that then would not become available in those first couple of games. We do have quite a few arms that haven't pitched yet, which can be a good or a bad thing. If you go too many days off, you kind of lose your rhythm, but that's part of playoff baseball. If these guys want to be big league pitchers, that's what can happen at that level too." The ValleyCats got two insurance runs on a ninth-inning blast to left by Encarnacion. And that put the champions of the Stedler Division one stage away from the biggest celebration of the season. "I feel like it's been consistency," Bell said. "We haven't had too much of a stretch where we've won a lot or lost a lot in a row. We've always kind of been staying in the middle, trying to win series all throughout the year. More than anything, it's been a situation where it's been next man up. I think we've had over 60 players come through our team this year. I don't know where that ranks as far as other teams in short season, but it has to be toward the top." Tri-City and Hudson Valley matched up nine times during the regular season with the Renegades winning five of the contests. "I think it's going to be really exciting," Bell said. "The last game that we played against them (Aug. 25) had a really good playoff atmosphere. It was an extra-innings game where we had a two-run, go-ahead homer in the 10th, and then in the bottom of the 10th, they hit a walk-off, three-run home run. I'm really excited about it. They were the best team in the regular season, so if we want to be the best, we've got to beat the best. I'm really excited about it."